I’m super excited for the “baking” posts this week. Tune in each day to find new holiday recipes from some the BEST. 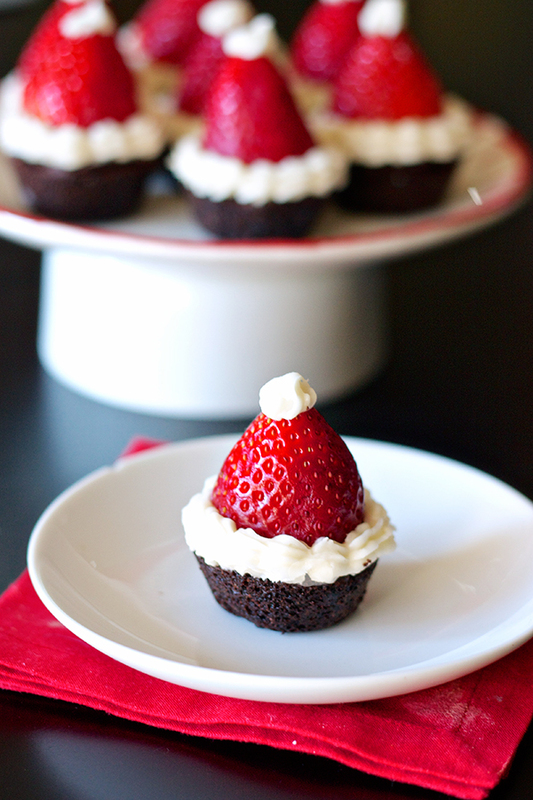 I’m kicking off baking week with these cute and YUMMY brownie strawberry Santa hats. 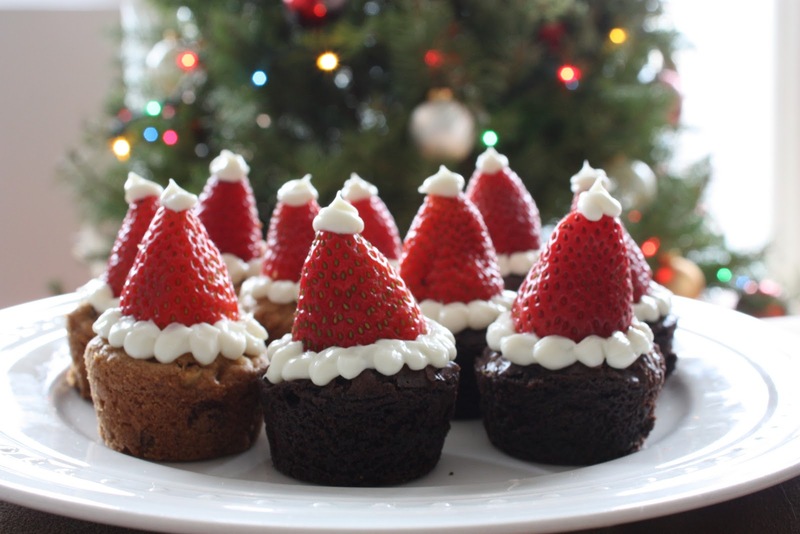 These are the perfect dessert for your Christmas party. Here is 3 good reasons why you MUST make them this year. 1. They are SO easy and will make your display super cute. 2. Who doesn’t love chocolate strawberries? 3. Your friends will love you. That’s all. So cute, and so so easy. I highly recommend you to bring these to any holiday party in the coming days. Your friends and family will go crazy for them, I know mine did! Heat oven to 350 degrees and spray mini muffin pan(s) with cooking spray. In 2 quart saucepan combine 1 cup butter and chocolate squares. Cook over medium heat, stirring occasionally, until melted (4-6 minutes). Stir in flour, eggs, baking powder, salt and vanilla until well combined. Use a medium cookie scoop to drop batter into the mini muffin tins, each one about half full. Cook about 15 minutes, until a toothpick inserted in the center comes out clean. Allow to cool completely before decorating. Meanwhile, cut stems off of strawberries, so that the top is flat. 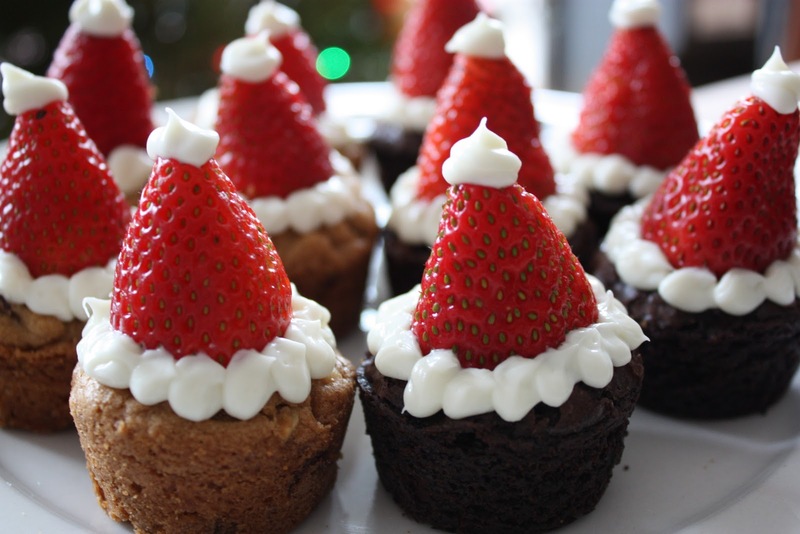 Turn the strawberries upside down and place one on top of each brownie. 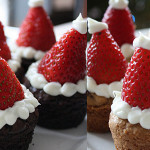 Place the frosting into a decorating bag or bottle and squeeze around the bottom of each strawberry to represent the rim of Santa's hat. Then squeeze a small drop onto the tip of the strawberry.